What Does a Conference Coordinator Do? Conference coordinators work on all aspects of a meeting to ensure its success. A conference coordinator, also known as a meeting and convention planner, does whatever is necessary to facilitate the organization of and arrangements for meetings, conferences, and other special events. They are typically responsible for communicating with all types of businesses and audiences who need someone to organize an event. Planning, coordinating, and even directing the details of conferences or any other type of special event are a critical part of this job. Budgets, vendor contracts, and travel arrangements may also be the job of a conference coordinator. Work hours for those in this position typically run over 40 hours a week and may even require working late night or weekend hours. 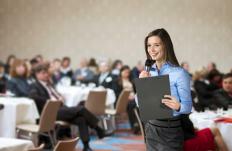 Conference coordinators may contact sponsoring organizations and match them to the best, most receptive audience. Coordinators must have a basic understanding of the companies or organizations that sponsor the conferences. Part of a conference coordinator's success hinges on his or her ability to understand the impression that a company wishes to communicate and to deliver it to those who will best receive it. For example, a conference coordinator may contact a cancer research group that wants to tout their latest findings with several cancer survivor groups in a specific region of the country. Bringing these two groups together is one of the most important duties of a conference coordinator. Due to the preparation necessary for an event, conference coordinators typically work under extreme pressure and limited time constraints. This requires a great deal of patience and the ability to maintain composure and professional presence while continuing to work under difficult conditions. A conference coordinator needs to quickly establish a working relationship with a large number of local vendors and service providers in order to successfully plan and carry through all tasks necessary to produce a favorable outcome for any conference. Exceptional organizational skills are necessary for a conference coordinator to function successfully. A conference coordinator is responsible for the logistical and administrative arrangements associated with an event, so he or she may communicate with many different types of people, including highly placed executives, various service vendors, suppliers, technicians, and conference attendees. The ability to make deals and negotiate contracts for services while working within a predetermined budget is a big part of this job. Conference coordinators spend a good deal of their time on the telephone, working out details for the conferences they are planning. When not in their office, they are typically working on-site at a hotel, convention center, or other conference venue. Depending upon the type and size of the companies for which they work, coordinators may travel extensively. Minimal travel is required for local organizations or events, but working with a larger company with international offices may require travel abroad. Working hours are typically irregular and may go beyond the typical 40-hour work week. After hours duties and weekend work can be typical, especially during the conferences themselves. How Do I Become a Conference Coordinator? What Does a Conference Manager Do? How Do I Become a Conference Manager? What is a Field Coordinator? What is a Team Coordinator?